	Shih VE, Efron ML. Pyridoxine unresponsive homocystinuria. Final diagnosis of MGH case 19471. New England Journal of Medicine, 1970;283:1206-1208. This case report describes the diagnosis of homocystinuria in the 9 year old niece of the case of her uncle with homocystinuria, as first published in 1933. Case Record of the Massachusetts General Hospital, Case 19471. Marked cerebral symptoms following a limp of three months’ duration. New England Journal of Medicine, 1933;209:1063-1066. This is the first case of homocystinuria published in the medical literature. Although the disease homocystinuria was first discovered and described in 1962, this case was identified as the 8 year old uncle of a child diagnosed with homocystinuria in 1965. Mudd SH, Finkelstein JD, Irrevere F, Laster L. Homocystinuria: an enzymatic defect. Science, 1964;143:1443-1445. This study established deficiency of cystathionine synthase as the cause of the most common form of the inherited disease of methionine metabolism, homocystinuria. Mudd SH, Levy HL, Abeles RH. A derangement in the metabolism of vitamin B12 leading to homocystinuria, cystathioninuria, and methyl malonic aciduria. Biochemical and Biophysical Research Communications, 1969;35:121-126. This case report is the first in the medical literature describing cobalamin C disease. McCully KS. Vascular pathology of homocysteinemia: implications for the patho-genesis of arteriosclerosis. American Journal of Pathology, 1969;56:111-128. This report describes the discovery of arteriosclerotic plaques in the arteries of two different patients with homocystinuria, one with cystathionine synthase deficiency, and one with cobalamin C disease. The study concludes that homocysteine causes arteriosclerotic plaques in homocystinuria by a direct effect of the amino acid on the cells and tissues of the arteries. The hypothesis is presented regarding the importance of elevation of blood homocysteine in arteriosclerotic disease occurring in the general population without these rare inherited enzymatic abnormalities. Kuhn TS. The Structure of Scientific Revolutions. Chicago: University of Chicago Press, 1952. This important study of the philosophy of scientific revolutions emphasizes the shift in scientific paradigms by observation of new facts that cannot be explained by previous scientific theories. Lawrence, Fane. Machines of the Mind. Sculptures of Lawrence Fane. Richmond: University of Richmond catalogue, 2002. Lawrence Fane was a private school graduate from Kansas City, the son of a prominent attorney. As room-mates, Larry and I became quite close because of our mutual interests in art, music, medicine and psychology. Larry was a pre-med student, but after acceptance to Washington University Medical School, he decided that he would become an artist and sculptor. He studied at the Boston Museum School and with George Demetrious of Rockport, Massachusetts before winning the Rome Prize and specializing in abstract sculpture. He was Professor of Fine Arts at Queens College in New York for many years and died in 2008 at the age of 75. Black, NH, Conant JB. Practical Chemistry. New York: Macmillan, 1934. This primer in high school chemistry was written by James Conant and Henry Black, Conant’s teacher of chemistry at Roxbury Latin School in Boston, in order to interest students in the practical aspects of chemistry. Conant became an outstanding physical organic chemist at Harvard before he was appointed President of Harvard in 1933. One of Conant’s faculty members, Leonard Nash, used some of the experiments from this book to excite Harvard freshmen about chemistry. One of the experiments was to inflate soap bubbles with hydrogen gas and ignite them with a spark to cause a loud explosion in the lecture hall. In repeating some of these experiments as a boy scientist in Denver and Memphis, my specialties were to ignite paper with sulfuric acid and potassium permanganate crystals, making firecrackers with black powder made from potassium nitrate, charcoal and sulfur, and igniting magnesium flares with burning black powder. I survived these experiments and an unsuccessful attempt to synthesize nitroglycerin from nitric acid and glycerin. Kilmer CH. The History of the Kilmer Family in America. Elmira NY: Advertiser Association, 1897. The introduction of this genealogical book recounts the dramatic circumstances surrounding immigration of Johannes Kűhlmer and his family to the Hudson Valley in Germantown, New York in 1709. The name was anglicized to Kilmer in subsequent generations. The Kilmer family became land owners through a land grant from the King of England. Their descendants migrated widely throughout America, and many of them became ministers, doctors, and pharmacists. A prominent medicinal chemist, Frederick B. Kilmer, became Vice President and Director of Research at Johnson and Johnson Company in New Brunswick, New Jersey in the late 19th century. His son was Joyce Kilmer, a prominent journalist and poet in New York City, who was killed by a sniper’s bullet on the last day of World War One in 1918. Tolstedt GL, Tolstedt V. Seven Miles West of Herreid, South Dakota. Rockford IL: Private publication, 1998. This book recounts the founding of the Spring Valley farm in 1890 by Juda and Maria Litwinenco near Herreid, South Dakota. The farm grew to 1000 acres and supported three generations of Litwinenco descendants until it was sold in 1989. Richardson J, McCully M. Picasso. A Life. Volume 1 The early years. New York: Random House, 1992. My sister Marilyn McCully is the art historian collaborator for this multi-volume biography of Picasso. Schlesinger A. Veritas. Harvard College and the American Experience. Chicago: Ivan R. Dee, 2005. Bjork DW. B.F. Skinner, a life. New York: HarperCollins, 1993. Skinner BF. Schedules of Reinforcement. New York: Appleton-Century-Crofts, 1957. Skinner BF. Walden Two. New York: MacMillan, 1948. McCully CH, Miller LL. Challenge for Change in Counselor Education. Minneapolis: Burgess, 1969. This collection of my father’s essays and speeches, edited by Lyle Miller, describes his views of the philosophical basis for student counseling. He was Director of the Counseling Service for the Veterans Administration in the 1950s and later Specialist in the US Office of Education until his death in 1965. Bryson C. The Fluoride Deception. New York: Seven Stories Press, 2004. This book describes the important experiments of Phyllis Mullenix showing the neurotoxic effects of fluoride and the rejection of her discoveries by the dental and public health establishment. Merk F. History of the Westward Movement. New York: Knopf, 1978. McCully KS. The significance of wheat in the Dakota Territory, human evolution, civilization and degenerative diseases. Perspectives in Biology and Medicine, 2001;44:52-61. This article describes the settlement of Spring Valley farm near Herreid, South Dakota in 1890 by my grandparents, Judah and Maria Litwinenco and their three children, who had emigrated from Odessa, Ukraine. Durum wheat kernels were smuggled into New York in the pockets of my grandfather’s overcoat, because his Ukrainian Russian friends told him that the climate of South Dakota is similar to that of Ukraine and would support growth of “macaroni wheat.” The article also describes how milling of wheat leads to losses of micronutrients, including folic acid and pyridoxine, leading to nutritional deficiencies and degenerative diseases. McCully KS. Dinner with the Schlesingers. The Culinary Times, XVII, No. 2, fall 2007. This article describes my experiences as a “house boy” with Arthur and Marion Schlesinger during my senior year at Harvard. Fieser LF. Cholesterol and companions. VII Cholesterol dibromides. Journal of the American Chemical Society, 1953;75:5421-5422. This publication describes Fieser’s important method for purification of cholesterol that was used by C. Bruce Taylor to demonstrate the inability of pure cholesterol to produce arterial plaques in animals. Peng S-K, Taylor CB. Cholesterol autoxidation, health and arteriosclerosis. World Review Nutrition-Dieta, 1984;44:117-154. This article describes the toxicity of cholesterol oxides in cells and tissues, the atherogenic effect of cholesterol oxides, and the inability of pure cholesterol to produce arterial plaques in animals. DeKruif P. Microbe Hunters. New York: Harcourt Brace, 1926. Bloch K. The Biological Synthesis of Cholesterol. Nobel Lectures, December 11, 1964. Gautschi F, Bloch K. On the structure of an intermediate in the biological demethylation of lanosterol. Journal of the American Chemical Society, 1957;79:684-689. A footnote to this article describes the quantitative isolation of lanosterol from pig liver by KS McCully. Beecher HK, Altschule MD. Medicine at Harvard. The First Three Hundred Years. Hanover, NH: University Press of New England, 1977. This book describes the rich intellectual environment of Harvard Medical School and the affiliated medical centers during the period when I was a student from 1955-1959. Mann GV, Andrus SB, McNally A, Stare FJ. Experimental atherosclerosis in Cebus monkeys. Journal of Experimental Medicine, 1953;98:195-218. Stanbury JB, Wyngaarden JB, Frederickson DS. The Metabolic Basis of Inherited Disease. 7th Ed. New York: McGraw-Hill, 1960. This classic text is now in its 7th Edition and describes the explosion of information about genomic medicine and disease. An important chapter on homocystinuria was written by S. Harvey Mudd in the 6th edition, describing the metabolic origin of this disease. Moss RW. Free Radical. Albert Szent-Gyorgi and the battle over vitamin C. New York: Paragon House, 1988. Cantoni GL. S-adenosyl methionine: present status and future perspectives. In F Salvatore, E Borek, V Zappia, HG Williams-Ashman, F Schlenk, editors. The Biochemistry of Adenosylmethionine. New York: Columbia University Press, 1977. Holley RW. Alanine transfer RNA. Nobel lectures, December 11, 1968. McCully KS, Cantoni GL. On the specificity of takadiastase T1 ribonuclease. Biochimica et Biophysica Acta, 1961;51:190-192. McCully KS, Cantoni GL. Studies on soluble ribonucleic acid (S-RNA) of rabbit liver. A base sequence model of S-RNA. Journal of Molecular Biology, 1962;5:497-505. Pontecorvo G. Trends in Genetic Analysis. New York: Columbia University Press, 1958. Forbes T, McCully KS. The use of p-fluorophenylalanine with “master strains” of Aspergillus nidulans for assigning genes to linkage groups. Genetical Research (Cambridge), 1965;6:352-359. Watson JD. The Double Helix: A personal account of the discovery of the structure of DNA. New York: Norton, 1980. Watson JD. The involvement of RNA in the synthesis of proteins. Nobel Lectures, December 11, 1962. Watson JD. Succeeding in science: some rules of thumb. Science, 1993;261:1812-1813. McCully KS. Protein synthesizing activity of human neoplastic and normal thyroid tissue in chick embryo mesonephros organ cultures. International Journal of Cancer, 1968;3:142-149. Shih V, Efron M. Pyridoxine unresponsive homocystinuria. Final diagnosis of case 19471 from 1933. New England Journal of Medicine, 1970;283:1206-1208. Case Records of the Massachusetts General Hospital. Marked cerebral symptoms following a limp of three week’s duration. New England Journal of Medicine, 1933;209:1063-1066. DuVigneaud V. A Trail of Research in Sulfur Chemistry and Metabolism. Ithaca NY: Cornell University Press, 1952. Carson NAJ, Neill DW. Metabolic abnormalities detected in a survey of mentally backward individuals in Northern Ireland. Archive of Diseases of Childhood, 1962;37:505-513. Gibson JB, Carson NAJ, Neill DW. Pathological findings in homocystinuria. Journal of Clinical Pathology, 1964;17:427-437. Schimke RN, McKusick VA, Huang T, Pollack AD. Homocystinuria. Studies of 20 families with 38 affected members. Journal of the American Medical Association, 1965;193:711-719. Carson NAJ, Dent CE, Field CMB, Gaull GE. Homocystinuria. Clinical and pathological review of ten cases. Journal of Pediatrics, 1965;66:565-583. Mudd SH, Finkelstein JD, Irreverre F, Laster L. Homocystinuria: an enzymatic defect. Science, 1964;143:1443-1445. Spaeth GL, Barber GW. Homocystinuria in a mentally retarded child and her normal cousin. Transactions of the American Academy of Ophthmology and Otolaryngology, 1965;69:912-930. Mudd SH, Levy HL, Abeles RH. A derangement in the metabolism of vitamin B12 leading to homocystinuria, cystathioninuria and methylmalonic aciduria. Biochemical and Biophysical Research Communications, 1968;35:121-126. Rinehart JF, Greenberg LD. Arteriosclerotic lesions in pyridoxine-deficient monkeys. American Journal of Pathology, 1949;25:481-491. McCully KS. Vascular pathology of homocysteinemia: implications for the pathogenesis of arteriosclerosis. American Journal of Pathology, 1969;56:111-128. Cannon WB. The Way of an Investigator. A scientist’s experiences in medical research. New York: Norton Press, 1945. Moore S, Spackman DH, Stein WH. Chromatography of amino acids on sulfonated polystyrene resins. Analytical Chemistry, 1958;30:1185-1190. Rinehart JF, Greenberg LD. Pathogenesis of experimental arteriosclerosis in pyridoxine deficiency. With notes on similarities to human arteriosclerosis. Archives of Pathology, 1951;51:12-18. Rinehart JF, Greenberg LD. Vitamin B6 deficiency in the rhesus monkey. With particular reference to the occurrence of atherosclerosis, dental caries and hepatic cirrhosis. American Journal of Clinical Nutrition, 1956;4:318-328. McCully KS. Hyperhomocysteinemia and arteriosclerosis: historical aspects. Clinical Chemistry and Laboratory Medicine, 2005;43:980-986. McCully KS. The homocysteine theory of arteriosclerosis: development and current status. In: Gotto AMJr, Paoletti R, editors. Atherosclerosis Reviews, Volume 11. New York: Raven Press, 1983, pp 157-246. McCully KS. Homocysteine and vascular disease: role of folate, choline and lipoproteins in homocysteine metabolism. In: Szuhaj BH, Zeisel SH, editors. Proceedings of the 7th International Symposium on Phospholipids, Champaign IL: ACOS Press, 1998, pp 117-130. McCully KS, Ragsdale BD. Production of arteriosclerosis by homocysteinemia. American Journal of Pathology, 1970;61:1-11. McCully KS, Wilson RB. Homocysteine theory of arteriosclerosis. Atherosclerosis, 1975;22:215-227. Kuzuya F, Yoshimine N. [Homocysteine theory of arteriosclerosis.] Domyakukoka (Journal of the Japan Atherosclerosis Society), 1978;6:135-139. McCully KS. Homocysteine metabolism in scurvy, growth and arteriosclerosis. Nature 1971;231:391-392. Clopath P, Smith VC, McCully KS. Growth promotion by homocysteic acid. Science, 1976;192:372-374. Ricci R, McCully KS. [Effect of homocysteic acid on chondrocytes in vitro.] Atti Assozione Genetica Italia, 1972;17:25-28. McCully KS. Growth disorders and homocysteine metabolism. Annals of Clinical and Laboratory Science, 1975;5:147-152. Spindel E, McCully KS. Conversion of methionine to homocysteine thiolactone in liver. Biochimica et Biophysica Acta, 1974;343:687-691. Jakubowski H. Proofreading in vivo: editing of homocysteine by methionyl t-RNA synthetase in Escherichia coli. Proceedings of the National Academy of Sciences USA, 1990;87:4504-4508. McCully KS. Homocysteine thiolactone metabolism in malignant cells. Cancer Research, 1976;36:3198-3202. Jakubowski H, Goldman E. Synthesis of homocysteine thiolactone by methionyl tRNA synthetase in cultured mammalian cells. Federation of European Biochemical Sciences, 1993;3:237-240. McCully KS, Clopath P. Homocysteine compounds which influence growth of a malignant neoplasm. Chemotherapy, 1977;23:44-49. Wilcken DEL, Wilcken B. The pathogenesis of coronary artery disease. A possible role for methionine metabolism. Journal of Clinical Investigation, 1976;57:1079-1982. McCully KS. Homocysteine, atherosclerosis and thrombosis: implications for oral contraceptive users. American Journal of Clinical Nutrition, 1975;28:542-549. Harker LA, Ross R, Slichter SJ, Scott CR. Homocystine-induced arteriosclerosis. Role of endothelial cell injury and platelet response to its genesis. Journal of Clinical Investigation, 1976;58:731-741. Kanwar YS, Manaligod JR, Wong WK. Morphologic studies in a patient with homocystinuria due to 5,10-methylenetetrahydrofolate reductase deficiency. Pediatric Research, 1976;10:598-609. Suzman MM. Effect of pyridoxine and low animal protein diet in coronary artery disease. Circulation, 1973;48:Supplement IV-254. This abstract describes Suzman’s experience with 17 patients with coronary artery disease given a low animal protein diet and 100 mg/day of vitamin B6 plus a B complex supplement for 13 months. All patients experienced increased exercise tolerance with complete or partial relief of angina, regression of electrocardiographic abnormalities, and improvement of the glucose tolerance test in 2 diabetic patients. Controlled prospective trials of this approach were recommended. Gruberg ER, Raymond SA. Beyond Cholesterol. Vitamin B6, arteriosclerosis and your heart. New York: St. Martin’s Press, 1981. This 1981 book contains the first description of the homocysteine theory of arteriosclerosis published for the general reader. The book describes the status of the theory in the late 1970s and provides detailed information and references to the scientific literature to support the previous article in Atlantic Monthly in 1979. Moses Suzman and I consulted with and advised the authors while they were compiling the information and writing the manuscript for this book. Gruberg ER, Raymond SA. Beyond Cholesterol. A new theory on arteriosclerosis. Atlantic Monthly, May 1979, pp 59-65. This article for the general reader excited controversy and media interest when published in 1979. This is the first presentation of the homocysteine theory of arteriosclerosis published by the non-scientific press. Diet Debate. Is cholesterol the culprit? Time Magazine, August 6, 1979. Mann GV. Blood changes in experimental primates fed purified diets: Pyridoxine and riboflavin deficiency. Vitamins and Hormones, 1968;26:465-485. This article describes the effect of profound deficiency of vitamin B6 in the diet of monkeys. The animals became anemic, emaciated, several died, and the aortas contained no lipid deposits by fat staining. This apparent contradiction of the earlier results of Rinehart and Greenberg is attributed to the severity of the experimental deficiency of vitamin B6 in Mann’s monkeys, explaining why he did not observe arteriosclerotic plaques. Rinehart and Greenberg’s monkeys experienced intermittent deficiency of vitamin B6 and survived up to 18 months without severe anemia and emaciation. Sunderman FWJr, Hopfer SM, Knight JA, McCully KS, Cecutti AG, Thornhill PG, Conway K, Miller C, Patierno SR, Costa M. Physicochemical characteristics and biological effects of nickel oxides. Carcinogenesis, 1987;8:305-313. This article summarizes the experiments with nickel toxicity that were completed while I collaborated with William Sunderman’s research group in 1980. During 1980 my faculty appointment was Visiting Professor of Laboratory Medicine at the University of Connecticut. William P. Homans, Jr. Obituary. New York Times, February 13, 1997. Brattstrom LE, Hardebo JE, Hultberg BL. Moderate homocysteinemia – a possible risk factor for arteriosclerotic cerebrovascular disease. Stroke, 1984;15:55-59. McCully KS. Homocysteine theory of arteriosclerosis: development and current status. In: Gotto AMJr, Paoletti R, editors. Atherosclerosis Reviews, Volume 11. New York: Raven Press; 1983, pp 157-246. This monograph is the first detailed and comprehensive publication in the medical literature to describe the discovery and early development of the homocysteine theory of arteriosclerosis. Suzman MM. Effect of pyridoxine and low animal protein diet in coronary artery disease. Circulation, 1973;48:Supplement IV-254. This is the first intervention trial in the medical literature demonstrating a beneficial effect of the homocysteine theory of arteriosclerosis in patients with coronary heart disease. Jacques PF, Selhub J, Bostom AG, Wilson PWF, Rosenberg IH. The effect of folic acid fortification on plasma folate and total homocysteine concentrations. New England Journal of Medicine, 1999;340:1449-1454. This study analyzed plasma folate and homocysteine concentrations in a group of Framingham Heart Study participants in 1996 and in 1998, before and after fortification of the US food supply with synthetic folic acid. The results showed that plasma folate doubled and plasma homocysteine declined 15% after fortification. Wang X, Qin X, Demirtas H. Efficacy of folic acid supplementation in stroke prevention: a meta-analysis. Lancet, 2007;369:1876-1882. This meta-analysis of almost 17,000 subjects concluded that supplementation with B vitamins including folic acid, vitamin B6 and vitamin B12 significantly reduced the risk of stroke by 18%. They found that a greater beneficial effect was seen in those trials with a treatment duration of greater than 3 years (29% reduction), no prior fortification of grain foods 24 with folic acid (24% reduction), more than 20% decrease in plasma homocysteine concentration (23% reduction), and no prior history of stroke (25% reduction). Yang Q, Friedman JM, Botto LD. Improvement in stroke mortality in Canada and the United States, 1990 to 2002. Circulation, 2006;113:1335-1343. This epidemiological study showed that the decline in mortality from stroke suddenly accelerated in 1998 after fortification of refined grain foods with folic acid was mandated by the Food and Drug Administration in the US and Canada. There was no change in the decline in stroke mortality in the United Kingdom, where folic acid fortification was not mandated. McCully KS, Vezeridis MP. Antineoplastic activity of N-maleimide homocysteine thiolactone amide encapsulated within liposomes. Proceedings of the Society for Experimental Biology and Medicine, 1985;180:57-61. McCully KS, Vezeridis MP. Antineoplastic activity of a rhodium trichloride complex of oxalyl homocysteine thiolactone. Cancer Investigation, 1987;5:25-30. McCully KS, Boyko ER, Carpenter GB. Homocysteine thiolactone perchlorate: X-ray crystallography of a lipophilic salt. Chemical-Biological Interactions, 1985;56:121-124. McCully KS, Carpenter GB. Structure of pyridoxal homocysteine thiolactone enamine. Acta Crystallographica, 1987;C43:2345-2347. McCully KS, Vezeridis MP. Chemopreventive and antineoplastic activity of N-homocysteine thiolactonyl retinamide. Carcinogenesis, 1987;8:1559-1562. Kazimir M, Wilson FR II. Prevention of homocysteine thiolactone-induced athero-genesis in rats. Research Communications in Molecular Pathology and Pharmacology, 2002;5:179-198. McCully KS, Vezeridis MP. Chemopreventive effect of N-homocysteine thiolactonyl retinamido cobalamin on carcinogenesis by ethyl carbamate in mice. Proceedings of the Society for Experimental Biology and Medicine, 1989;191:346-351. McCully KS, Tzanakakis GN, Vezeridis MP. Inhibition of neoplastic growth by N-homocysteine thiolactonyl retinamido cobalamin. Research Communications in Chemical Pathology and Pharmacology, 1989;66:117-122. McCully KS, Carvalho ACA. Homocysteine thiolactone, N-homocysteine thiolactonyl retinamide and platelet aggregation. Research Communications in Chemical Pathology and Pharmacology, 1987;56:349-360. McCully KS, Vezeridis MP. Histopathological effects of homocysteine thiolactone on epithelial and stromal tissues. Experimental and Molecular Pathology, 1989;51:159-170. McCully KS, Tzanakakis GN, Vezeridis MP. Effect of the synthetic N-homocysteine thiolactonyl derivatives, thioretinamide and thioretinaco on growth and lactate production by malignant cells. Research Communications in Chemical Pathology and Pharmacology, 1992;77:125-128. Ellis JM. Treatment of carpal tunnel syndrome with vitamin B6. Southern Medical Journal, 1987;80:882-884. Folkers K, Ellis JM, Watanabe T. Biochemical evidence for a deficiency of vitamin B6 in the carpal tunnel syndrome based on a cross-over clinical study. Proceedings of the National Academy of Sciences USA, 1978;75:3410-3412. Ellis JM, McCully KS. Prevention of myocardial infarction by vitamin B6. Research Communications in Molecular Pathology and Pharmacology, 1995;89:208-220. McCully KS. Atherosclerosis, serum cholesterol and the homocysteine theory: a study of 194 consecutive autopsies. American Journal of the Medical Sciences, 1990;299:217-221. McCully KS, Vezeridis MP. Homocysteine thiolactone in arteriosclerosis and cancer. Research Communications in Chemical Pathology and Pharmacology, 1988;59:107-119. McCully KS, Vezeridis MP. Homocysteinemia and arteriosclerosis: failure to isolate homocysteine thiolactone from plasma and lipoproteins. Research Communications in Chemical Pathology and Pharmacology, 1989;63:301-304. Jakubowski H. The determination of homocysteine-thiolactone in biological samples. Analytical Biochemistry, 2002;308:112-119. Olszewski AJ, Szostak WB. Homocysteine content of plasma proteins in ischemic heart disease. Atherosclerosis, 1988;69:109-113. Olszewski AJ, McCully KS. Homocysteine content of lipoproteins in hypercholestero-lemia. Atherosclerosis, 1991;88:61-68. Olszewski AJ, Szostak WB, McCully KS. Plasma glucosamine and galactosamine in ischemic heart disease. Atherosclerosis, 1990;82:75-83. Olszewski AJ, Szostak WB, Bialkowska M, Rudnicki S, McCully KS. Reduction of plasma lipid and homocysteine levels by pyridoxine, folate, cobalamin, choline, riboflavin and troxerutin in atherosclerosis. Atherosclerosis, 1989;75:1-6. Olszewski AJ, McCully KS. Fish oil decreases serum homocysteine in hyperlipemic men. Coronary Artery Disease, 1993;4:53-60. McCully KS, Olszewski AJ, Vezeridis MP. Homocysteine and lipid metabolism in atherogenesis: effect of the homocysteine thiolactonyl derivatives, thioretinaco and thioretinamide. Atherosclerosis, 1990;83:197-206. Naruszewicz M, Mirkiewicz E, Olszewski AJ, McCully KS. Thiolation of low-density lipoprotein by homocysteine thiolactone causes increased aggregation and altered interaction with cultured macrophages. Nutrition, Metabolism and Cardiovascular Disease, 1994;4:70-77. Dziedzic D, White HJ. Quantitation of ozone-induced lung lesion density after treatment with an interferon inducer or an anti-interferon antibody. Toxicology Letters, 1987;39:51-62. Wieland T, Bäuerlein E. N-acetyl-homocystein thiolacton als Vermitter einer oxydativen Synthese von Adenosindiphosphat und Adenosintriphosphat aus Adenosinmonophosphat und Orthophosphat. Chemische Berichte 1967;100:3869-3876. Lambeth DO, Lardy HA. The oxidation of thioethers by bromine: a model system for oxidative phosphorylation. Biochemistry, 1969;8:3395-3402. Slater EC. The mechanism of phosphorylation in the respiratory chain. Nature, 1953;172:975-978. McCully KS. Chemical pathology of homocysteine I. Atherogenesis II. Carcinogenesis and homocysteine thiolactone metabolism III. Cellular function and aging. Annals of Clinical and Laboratory Science, 1993;23:477-493, 1994;24:27-59, 134-152.
	International Conference of Homocysteine Metabolism. Irish Journal of Medical Sciences, 1995;164 Supplement 15, pp 1-36. The first international meeting on homocysteine metabolism was held at Castle Dromoland, Ireland July 2-6, 1995. This landmark conference gathered the principal investigators from the USA, Europe and other countries to discuss how disturbances in homocysteine metabolism contribute to many important human diseases. Graham I, Refsum H, Rosenberg IH, Ueland PM, Shuman JM, editors. Homocysteine Metabolism: From Basic Science to Clinical Medicine. Boston: Kluwer, 1997, pp 251-257. This volume contains the full articles based on papers presented at the First International Conference on Homocysteine Metabolism, July 1995 in Ireland. Kanwar YS, Manaligod JR, Wong WK. Morphologic studies in a patient with homocystinuria due to 5,10-methylenetetrahydrofolate reductase deficiency. Pediatric Research, 1976;10:598-609. This article is the first in the medical literature to report the autopsy findings in a human case of the third major type of human homocystinuria, caused by deficiency of methylenetetrahydrofolate reductase. The demonstration of arterial plaques, steatosis of the liver, and other findings in this case independently supports the conclusion that homocysteine causes arterial plaques and other pathological changes by a direct effect of the amino acid on the cells and tissues of arteries, as reported in cases of cystathionine synthase deficiency and methionine synthase deficiency by KS McCully in the American Journal of Pathology in 1969. Wilcken DEL, Wilcken B. The pathogenesis of coronary artery disease. A possible role for methionine metabolism. Journal of Clinical Investigation, 1976;57:1079-1082. This study is the first human study of homocysteine metabolism in coronary heart disease, demonstrating accumulation of homocystine and homocysteine-cysteine disulfide in the plasma following an oral dose of methionine. Harker LA, Ross R, Slichter SJ, Scott CR. Homocystine-induced arteriosclerosis. Role of endothelial cell injury and platelet response to its genesis. Journal of Clinical Investigation, 1976;58:731-741. This report is the first published study to confirm the finding of arterial plaques in experimental animals treated with homocysteine, as first reported by KS McCully and BD Ragsdale in American Journal of Pathology in 1970. Brown MS, Goldstein JL. A receptor-mediated pathway for cholesterol homeostasis. Nobel Lectures, December 9, 1985. Brattstrom LE, Hardebo JE, Hultberg BL. Moderate homocysteinemia – a possible risk factor for arteriosclerotic cerebrovascular disease. Stroke, 1984;15:1012-1016. Boers GHJ, Smals AGH, Trijbels FJM, Fowler B, Bakkeren JAJM, Schoonderwaldt HC, Kleijer WJ, Kloppenborg PWC. Heterozygosity for homocystinuria in premature peripheral and cerebral occlusive arterial disease. New England Journal of Medicine, 1985;313:209-715. Murphy-Chutorian D, Wexman MP, Grieco AJ, Heininger JA, Glassman E, Gaull GE. Methionine intolerance: a possible risk factor for coronary disease. Journal of the American College of Cardiology, 1985;6:725-730. Clarke R, Daly L, Robinson K, Naughten E, Cahalane S, Fowler B, Graham I. Homocysteinemia: an independent risk factor for vascular disease. New England Journal of Medicine, 1991;324:1149-1155. Nygard O, Vollset SE, Refsum H, Stensvold I, Tverdal A, Nordrehaug JE, Ueland PM, Kvale G. Total plasma homocysteine and cardiovascular risk profile: the Hordaland Homocysteine Study. Journal of the American Medical Association, 1995;274:1526-1533. Shipchandler M, Moore E. Rapid, fully automated measurement of plasma homocysteine with Abbott IMx analyzer. Clinical Chemistry, 1995;41:991-994. Refsum H, Ueland PM, Svardal AM. Fully automated fluorescence assay for determining total homocysteine in plasma. Clinical Chemistry, 1989;35:1921-1927. Stampfer MJ, Malinow MR, Willett WC, Newcomer LM, Upson B, Ullman D, Tishler PV, Hennekens CH. A prospective study of plasma homocyst(e)ine and risk of myocardial infarction in US physicians. Journal of the American Medical Association, 1992;268:877-881. Selhub J, Jacques PF, Wilson PWF, Rush D, Rosenberg IM. Vitamin status and intake as primary determinants of homocysteinemia in an elderly population. Journal of the American Medical Association, 1993;270:2693-2698. Graham IM. Plasma homocysteine as a risk factor for vascular disease. The European Concerted Action Project. Journal of the American Medical Association, 1997;277:1775-1781. Boushey CJ, Beresford SAA, Omenn GS, Motulsky AG. A quantitative assessment of plasma homocysteine as a risk factor for vascular disease. Probable benefits of increasing folic acid intakes. Journal of the American Medical Association, 1995;274:1049-1057. Kolata G. New clue to heart disease: a vitamin lack. New York Times, July 4, 1995. McCully KS. The Homocysteine Revolution. Medicine for the New Millennium. New Canaan, Connecticut: Keats Publishing, 1997. McCully KS. Homocysteine and vascular disease. Nature Medicine, 1996;4:386-389. 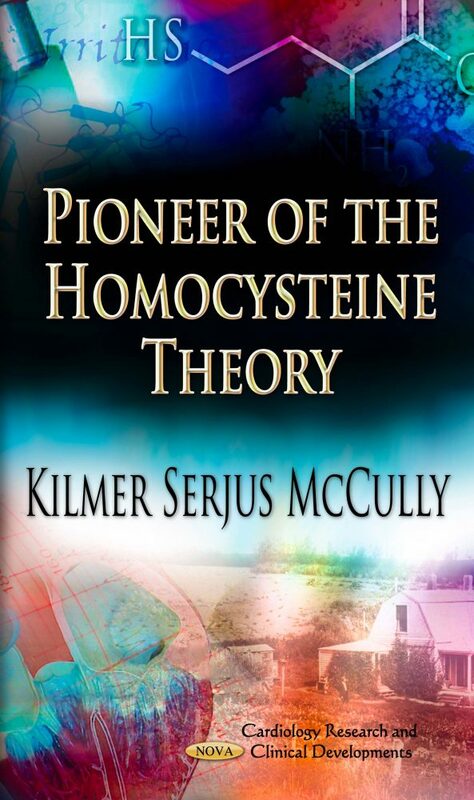 Larkin M. Kilmer McCully: pioneer of the homocysteine theory. Lancet, 1998;352:1364. Stacey M. The Fall and Rise of Kilmer McCully. New York Times Magazine, August 10, 1997. Rimm EB, Willett WC, Hu FB, Sampson L, Colditz GA, Manson JE, Hennekens C, Stampfer MJ. Folate and vitamin B6 from diet and supplements in relation to risk of coronary heart disease in women. Journal of the American Medical Association, 1998;279:359-364. McCully KS. Homocysteine, folate, vitamin B6 and cardiovascular disease. Journal of the American Medical Association, 1998;279:392-393. Price WA. Nutrition and Physical Degeneration. 50th Anniversary Edition. New Canaan, Connecticut: Keats Publishing, 1989. Masterjohn C. Dr. Price’s X-factor. Wise Traditions, 2007;8:14-32. Weston A. Price found in the 1930s that the combination of cod liver oil and the high-activation X-factor of spring butter oil concentrate was more effective than cod liver oil alone in treating his patients for dental caries and other chronic diseases. Price also implicated his X-factor in calcium metabolism and in prevention of arterial calcification 60 years before other scientists established these activities for vitamin K2. Nimptsch K, Rohrmann S, Linseisen J. Dietary intake of vitamin K and risk of prostate cancer in the Heidelberg cohort of the European Prospective Investigation into Cancer and Nutrition (EPIC-Heidelberg). American Journal of Clinical Nutrition, 2008;87:985-992. Ravnskov U. The Cholesterol Myths. Exposing the fallacy that saturated fat and cholesterol cause heart disease. Washington DC: New Trends Publishing, 2000. Ravnskov U. Fats and Cholesterol are Good for you. Sweden: GB Publishing, 2009. Ravnskov U. Ignore the Awkward! How the Cholesterol Myths are Kept Alive. Lexington KY, 2010.
	wwwTHINCS.ORG The International Network of Cholesterol Skeptics is a lively website containing informal and penetrating scrutiny regarding the shortcomings of the cholesterol/fat hypothesis of the origin of heart disease and related disease of aging. Bell WJJr. The College of Physicians of Philadelphia. A Bicentennial History. CantonMA: Science History Publications, USA, 1987. Estes JW, Smith BG. A Melancholy Scene of Desolation. The Public Response to the 1793 Philadelphia Yellow Fever Epidemic. CantonMA: Science History Publications, USA, 1997. McCully KS. The biomedical significance of homocysteine. Journal of Scientific Exploration, 2001;15:5-20. Kauffman JM. Malignant Medical Myths. Why Medical Treatment Causes 200,000 Deaths in the USA Each Year, and How To Protect Yourself. West ConshohockenPA: Infinity Press, 2006. Men’s Journal, May 2001. The Heroes Issue. McCully KS. Homocysteine and Disease: Basic and Clinical Aspects. Cellular and Molecular Biology, 2004;50:875-988. McCully KS. Homocysteine and Disease Symposium. Cellular and Molecular Biology, 2005;52:53-58. McCully KS. Hyperhomocysteinemia and arteriosclerosis: historical perspectives. Clinical Chemistry and Laboratory Medicine, 2005;43:980-986. McCully KS. Homocysteine, vitamins and vascular disease prevention. American Journal of Clinical Nutrition, 2007;86(suppl):1563S-1568S. Schnyder G, Roffi M, Pin R, Flammer Y, Lange H, Eberli FR, Meier B, Turi ZG, Hess OM. Decreased rate of restenosis after lowering of plasma homocysteine levels. New England Journal of Medicine, 2001;345:1593-1600. Schnyder G, Roffi M, Flammer Y, Pin R, Hess OM. Effect of homocysteine-lowering therapy with folic acid, vitamin B12 and vitamin B6 on clinical outcomes after percutaneous coronary intervention. Journal of the American Medical Association, 2002;288:973-979. Lange H, Suryapranata H, DeLuca G, Borner C, Dille J, Kallmayer K, Pasalary MH, Scherer E, Dambrink JH. Folate therapy and in-stent restenosis after coronary stenting. New England Journal of Medicine, 2004;350:2673-2681. Petersen JC, Spence JD. Vitamins and progression of atherosclerosis in hyper-homocyst(e)inemia. Lancet, 1998;351:263. Spence JD, Bang H, Chambless LE, Stampfer MJ. Vitamin intervention for stroke prevention trial. An efficacy analysis. Stroke, 2005;36:2404-2409. Toole JF, Malinow MR, Chambless LE, Spence JD, Pettigrew LC, Howard VJ, Sides EG, Wang CH, Stampfer MJ. Lowering homocysteine in patients with ischemic stroke to prevent recurrent stroke, myocardial infarction and death. Journal of the American Medical Association, 2004;291:565-575. The Heart Outcomes Prevention Evaluation (HOPE)2 Investigators. Homocysteine lowering with folic acid and B vitamins in vascular disease. New England Journal of Medicine, 2006;354:1567-1577. Bonaa KH, Njolstad I, Ueland PM, Schirmer H, Tverdal A, Stigen T, Wang H, Nordrehaug JE, Arnesen E, Rasmussen K. Homocysteine lowering and cardiovascular events after acute myocardial infarction. New England Journal of Medicine, 2006;354:1578-1588. Jamison RL, Hartigan P, Kaufman JS. Effect of homocysteine lowering on mortality and vascular disease in advanced chronic kidney disease and end-stage renal disease: a randomized controlled trial. Journal of the American Medical Association, 2007;298:1163-1170. Wang X, Qin X, Demirtas H, Li J, Mao G, Huo Y, Sun N, Lin L, Xu X. Efficacy of folic acid supplementation in stroke prevention: a meta-analysis. Lancet, 2007;369:1876-1882. McCully KS. Reply to EZ Soliman and OA Shalash. American Journal of Clinical Nutrition, 2008;87:1070-1071. Wald DS, Morris JK, Law M, Wald NJ. Folic acid, homocysteine and cardiovascular disease: judging causality in the face of inconclusive trial evidence. British Medical Journal, 2006;333:1114-1117. Clarke R, et al for the MTHFR Studies Collaboration Group. Homocysteine and coronary heart disease: meta-analysis of MTHFR case-control studies, avoiding publication bias. PLOS Medicine, 2012;9:1-11. Jacques PF, Selhub J, Bostom AG, Wilson PWF, Rosenberg IH. The effect of folic acid fortification on plasma folate and total homocysteine concentrations. New England Journal of Medicine, 1999;340:1449-1454. Yang Q, Botto LD, Erickson JD, Berry RT, Sambell C, Johansen H, Friedman JM. Improvement in stroke mortality in Canada and the United States, 1990 to 2002. Circulation, 2006;113:1335-1343. Decline in deaths from heart disease and stroke in the US 1900-1999. Morbidity and Mortality Weekly Reports, 1999;48:649-656. Havlik RJ, Feinleib M, Editors. Proceedings of the Conference on the Decline in Coronary Heart Disease Mortality. Bethesda MD: NIH Publication No. 79-1610. Kung HC, Hoyert DL, Xu J, Murphy SL. National Vital Statistics Reports, 2008;56:1-18. Ravnskov U, McCully KS. Vulnerable plaque formation from obstruction of vasa vasorum by homocysteinylated and oxidized lipoprotein aggregates complexed with microbial remnants and LDL autoantibodies. Annals of Clinical and Laboratory Science, 2009;39:3-16. Ravnskov U, McCully KS. Infections may be causal in the pathogenesis of atherosclerosis. American Journal of the Medical Sciences, 2012; In press. This review discusses the contradictions to the cholesterol hypothesis, the association of cardiovascular disease with infections, and new pathological evidence for the presence of Chlamydia pneumonia, mycoplasma pneumonia, and archaeal organisms in arterial plaques. McCully KS. Chemical Pathology of Homocysteine IV Excitotoxicity, oxidative stress, endothelial dysfunction and inflammation. Annals of Clinical and Laboratory Science, 2009;39:219-232. Kabara JJ. Fats are good for you and other secrets. How saturated fat and cholesterol actually benefit the body. Berkeley CA: North Atlantic Books, 2008. McCully KS, McCully ME. The Heart Revolution. The Extraordinary Discovery that Finally Laid the Cholesterol Myth to Rest. New York: Harperperennial, 2000. The soft cover edition of The Heart Revolution includes a six week plan for implementing the recommendations for adopting the principles of the homocysteine theory of arteriosclerosis for promotion of health. This edition contains a number of favorite family recipes for daily living that illustrate the main nutritional tenets of the theory. Ravnskov U. The Cholesterol Myths. Exposing the Fallacy that Saturated Fat and Cholesterol Cause Heart Disease. Washington DC: New Trends Publishing, 2000. Uffe Ravnskov, a Danish nephrologist and clinical chemist, practiced medicine in Sweden and later became an independent investigator with an interest in the cholesterol/fat hypothesis concerning the origin of vascular disease. Ravnskov’s contributions are discussed in Chapter 7. Kauffman JM. Malignant Medical Myths. Why Medical Treatment Causes 200,000 Deaths in the USA Each Year, and How to Protect Yourself. West Conshohocken PA: Infinity Publishing, 2006, pp 45-77. Joel Kauffman, Professor of Chemistry at University of the Sciences in Philadelphia, analyzes 11 cherished dogmas of the medical and public health establishment. He concludes that the advice to the public concerning these myths is based on unsound and unsupported science and may be responsible for as many as 200,000 deaths in the USA annually. The myths described in this book include (1) aspirin therapy for prevention of vascular disease, (2) the ineffectiveness of low carbohydrate diets for losing weight, (3) the use of cholesterol lowering statin drugs for prevention of mortality, (4) drug therapy for moderate hypertension, (5) prolongation of lifespan by moderate alcohol consumption, (6) exercise to extend lifespan, (7) the ineffectiveness of intravenous EDTA chelation therapy for atherosclerosis, (8) the danger of low dose ionizing radiation, (9) prologation of life by annual mammography in women, (10), improved rates of cancer survival from early detection and therapy, and (11) water fluoridation to prevent caries. In each case the author analyzes extensive published studies in the medical literature for critical evidence to support these myths, and in each case he finds that the evidence is lacking, contradictory, or otherwise non-supportive. Further comments are published in my review of this book in Journal of Scientific Exploration 2006;20:622-629. Levy D, Brinks S. A Change of Heart. How the Framingham Heart Study Helped Unravel the Mysteries of Cardiovascular Disease. New York: Knopf, 2005. This book describes the establishment of the Framingham Heart Study in 1948 and many of the principal findings published over the years. Chapter 13 “Renegade on the Trail of the Unknown” is devoted to a description of my contributions to the homocysteine theory of arteriosclerosis and my interaction with the investigators of the Framingham Heart Study. Enig, MG. The Oiling of America. Washington DC: New Trends Publishing, 1999. In this book the distinguished biochemist and investigator at the University of Maryland, Mary Enig, describes her discovery of excessive quantities of transfats in processed foods and the efforts of the food industry to discredit and suppress her findings. Kabara JJ. Fats Are Good for You and Other Secrets. How Saturated Fat and Cholesterol Actually Benefit the Body. Berkeley CA: North Atlantic Books, 2008. Doctor Kabara is a biochemist and student of George Leroy and Konrad Bloch of the University of Chicago. Kabara devoted his career to investigating the beneficial properties of saturated fats in the nonspecific immune system against microbial infections. He identified monolaurin, a mono-glyceride of the medium chain saturated fatty acid lauric acid, as the most potent of these natural fats in natural resistance to infectious diseases. Keys A. Coronary heart disease – The global picture. Atherosclerosis, 1975;22:149-192. Keys A. Coronary Heart Disease in Seven Countries. American Heart Association Monograph #29, 1970. Pinckney ER, Smith RL. Statistical analysis of Lipid Research Clinics Program. Lancet, 1987;8531:503-504. Peskin BS, Sim D, Carter MJ. The failure of Vytorin and statins to improve cardiovascular health: bad cholesterol or bad theory? Journal of American Physicians and Surgeons, 2008;13:82-87. Kastelein JJP, Akdim F, Stroess ESG. Simvistatin with or without ezetimibe in familial hypercholesterolemia. New England Journal of Medicine, 2008;358:1431-1443. Drogan D, Klipstein-Grobusch K, Dierkes J, Weikert C, Boeing H. Dietary intake of folate equivalents and risk of myocardial infarction in the European Prospective Investigation into Cancer and Nutrition (EPIC)—Potsdam Study. Public Health and Nutrition, 2006;9:465-471. Ishihara J, Iso H, Inone M, Iwasaki M, Okada K, Kita Y, Kobuko Y, Okayama A, Tsugane S for the JPHC Study Group. Intake of folate, vitamin B6 and vitamin B12 and the risk of CHD: the Japan Public Health Center-Based Prospective Study Cohort I. Journal of the American College of Nutrition, 2008;27:127-136. VanGuelpen B, Hultdin J, Johansson I, Witthoft C, Weinehall L, Eliasson M, Hallmans G, Palmqvist R, Jansson JH, Winkvist A. Plasma folate and total homocysteine levels are associated with the risk of myocardial infarction, independently of each other and of renal function. Journal of Internal Medicine, 2009;266:182-195. Ueland PM, Refsum H. Plasma homocysteine, a risk factor for vascular disease: plasma levels in health, disease and drug therapy. Journal of Laboratory and Clinical Medicine, 1989;114:473-501. Blaylock RL. Excitotoxins. The Taste that Kills. Albuqurque NM: Health Press NA, 1997. McCully KS. Chemical Pathology of Homocysteine. IV. Excitotoxicity, oxidant stress, endothelial dysfunction, and inflammation. Annals of Clinical and Laboratory Science, 2009;39:307-320. Bryson C. The Fluoride Deception. New York: Seven Stories Press, 2004. Roholm K. Fluorine Intoxication: A Clinical-Hygiene Study, with a review of the literature and some experimental investigation. London: HK Lewis, Ltd, 1937. Masters RD, Coplan MJ. A dynamic, multifactorial model of alcohol, drug abuse, and crime: linking neuroscience and behavior to toxicology. Social Science Information, 1999;38:591-624. Masters RD, Coplan MJ. Water treatment with silicofluorides and lead toxicity. International Journal of Environmental Studies, 1999;56:535-449. Yiamouyiannis J. Fluoride the Aging Factor. How to Recognize and Avoid the Devastating Effects of Fluoride. Delaware OH: Health Action Press, 1993. McCully KS. Homocysteine and vascular disease: the role of folate, choline and lipoproteins in homocysteine metabolism. In SH Zeisel, BJ Szuhaj, editors. Choline, Phospholipids, Health and Disease. Champaign IL: ACOS Press, 1998, pp 117-130. Daniel KT. The Whole Soy Story. The Dark Side of America’s Favorite Health Food. Washington DC: New Trends Publishing, 2007. Mann GV, Andrus SB, McNally A, Stare F. Experimental atherosclerosis in cebus monkeys. Journal of Experimental Medicine, 1953;98:195-218. This experiment was described to the Harvard Medical School Class of 1959 during a first year nutrition clinic presentation in 1955 by Frederick Stare, the Chairman of Nutrition at Harvard. My interest in experimental atherogenesis was first awakened by this study because of my previous experience in the biochemistry laboratory of Konrad Bloch at Harvard. Ingenbleek Y, McCully KS. Vegetarianism produces subclinical malnutrition, hyperhomocysteinemia and atherogenesis. Nutrition, 2012;28:148-153. This nutritional study of vegetarian subjects in Chad documents hyperhomocysteinemia in protein energy malnutrition secondary to loss of lean body mass from low dietary intake of sulfur and methionine. According to 2010 WHO estimates, half of coronary heart disease mortality occurs worldwide in vegetarian populations with dietary methionine deficiency. Plasma levels of lipoproteins are normal and dietary intake of folate and vitamin B6 are adequate, B12 is marginal, and other conventional risk factors are not elevated. Miller JA. Carcinogenesis by chemicals: an overview – GHA Clowes Memorial Lecture. Cancer Research, 1970;30:559-576. This comprehensive review describes the investigation of the electrophilic properties of carcinogenic chemicals and their role in production of experimental cancer. These studies implicated derivatives of methionine and homocysteine in chemical carcinogenesis by acetylaminofluorene, a highly potent synthetic chemical carcinogen. DeBaun JR, Miller EC, Miller JA. N-hydroxy 2 acetylaminofluorene sulfotransferase: its probable role in carcinogenesis and in protein-(methion-Syl) binding in rat liver. Cancer Research, 1970;30:577-595. This study implicates altered methionine and sulfate metabolism in the process of chemical carcinogenesis. Ryser HJP. Chemical carcinogenesis. New England Journal of Medicine, 1970;30:577-595. Ames BN. Dietary carcinogens and anticarcinogens. Science, 1983;231:1256-1264. This article discusses the many chemical carcinogens in food. The relation between mutagenesis, as detected by the Ames test, and carcinogenesis by dietary mutagens in animals are also analyzed and discussed. Gross L. Oncogenic Viruses. New York: Pergamon Press, 1961. This monograph describes the history of research on oncogenic viruses and the author’s discovery of the polyoma virus and induction of leukemia and solid cancers in mice. ZurHausen H. Viruses in human cancers. Science, 1991;254:1167-1173. The author describes the status of understanding of human oncogenic viruses and the particular role of human papilloma viruses in the causation of cervical cancer. Weinberg RA. The Biology of Cancer. New York: Garland Science, 2006. This monumental monograph and textbook describes the status of current understanding of the biology and genetics of cancer. There is no discussion of the Warburg effect on metabolism of cancer cells, and there is no discussion of the role of methionine and homocysteine in carcinogenesis. The emphasis is on a comprehensive understanding of how oncogenes and cellular signaling pathways are involved in carcinogensis. Warburg O. Metabolism of Tumors. London: Constable, 1930. This classic monograph describes the discovery and interpretation of the abnormal production of lactic acid by tumor tissues and embryonic tissues in the presence of oxygen. Warburg O. On the origin of cancer cells. Science, 1956;123:309-314. Warburg explains his concept of injury to respiration during carcinogenesis and the consequent shift in metabolism of carbohydrates to fermentation as a source of ATP for cellular metabolism. Weinhouse S. Oxidative metabolism of neoplastic tissues. Advances in Cancer Research, 1955;3:239-325. This monograph describes the status of understanding of the Warburg effect in 1955. Weinhouse was a leading critic of the Warburg approach to understanding abnormal metabolism in cancer cells. Watson JD. To fight cancer, know the enemy. New York Times Op-Ed editorial. August 6, 2009. James Watson declares that increased understanding of the metabolism of cancer cells is needed before a definitive treatment and prevention of cancer can be developed. He states that genetic aspects of cancer are now well understood. However, scientists need to explain the basis for the Warburg effect before a definitive understanding of the biochemistry of cancer cells can be understood. Copeland DH, Salmon WD. Neoplasms in the liver, lungs and other tissues of rats as a result of prolonged choline deficiency. American Journal of Pathology, 1946;22:1059-1079. Poirier LA. The role of methionine in carcinogenesis in vivo. Advances in Experimental Medicine and Biology, 1986;206:269-282. This review summarizes the evidence proving that a chemically defined diet which is deficient in choline is carcinogenic in animals. Hoffman RM. Altered methionine metabolism, DNA methylation and oncogene expression in carcinogenesis. Biochimica Biophysica Acta, 1984;738:49-87. Boerner P, Racker E. Methionine-sensitive glycolysis in transformed cells. Proceedings of the National Academy of Sciences USA, 1985;82:6750-6754. McCully KS. Chemical Pathology of Homocysteine. II. Carcinogenesis and Homocysteine Thiolactone Metabolism. Annals of Clinical and Laboratory Science, 1994;24:27-59. This review explains the detailed molecular processes by which thioretinaco ozonide catalyzes ATP synthesis during oxidative phosphorylation and cellular respiration in normal and in cancer cells. Wu LL, Wu JT. Hyperhomocysteinemia is a risk factor for cancer and a new potential tumor marker. Clinica Chimica Acta, 2002;322:21-28. Marchand LL, White KK, Nomura AMY, Wilkens LR, Selhub JS, Tiiridainen M, Goldman MT, Murphy SP, Henderson BE, Kolonel LN. Plasma levels of B vitamins and colorectal cancer risk: the Multiethnic Cohort Study. Cancer Epidemiology and Biomarkers Previews, 2009;18:2195-2201. Varmus H. The Art and Politics of Science. New York: Norton, 2009, pp 68-101. In this memoir Harold Varmus describes his discovery with Michael Bishop of the first proto-ongogene and its activation by the Rous sarcoma oncogenic virus. McCully KS. Homocysteine thiolactone metabolism in malignant cells. Cancer Research, 1976;36:3198-3202. This article describes the discovery of the inability of cancer cells to convert homocysteine thiolactone to sulfate. Excess homocysteine thiolactone becomes attached to proteins by peptide bonds. I suggest that normal cells contain a substance containing homocysteine thiolactone that prevents its accumulation by metabolism from methionine. Kazmir M, Wilson FR. Prevention of homocysteine thiolactone-induced atherogenesis in rats. Research Communications in Molecular Pathology and Pharmacology, 2002;111:179-198. This article describes an improved method for synthesis of thioretinamide and thioretinaco. The results show that these molecules prevent arteriosclerotic plaques caused by injection of homocysteine thiolactone in rats. Jakubowski H, Goldman E. Synthesis of homocysteine thiolactone by methionyl tRNA synthetase in cultured mammalian cells. FEBS Letters, 1993;317:237-240. This study shows that cultured malignant cells produce homocysteine thiolactone by an error-editing reaction involving the enzymatic activation of methionyl transfer RNA. Mintz B, Illmensee K. Normal genetically mosaic mice produced from malignant teratocarcinoma cells. Proceedings of the National Academy of Sciences USA, 1975;72:3585-3589. Weaver VM, Petersen OW, Wang F, Larabell CA, Briand P, Dansky C, Bissell MJ. Reversion of the malignant phenotype of human breast cancer cells in three-dimensional culture and in vivo by integrin blocking antibodies. Journal of Cell Biology, 1997;137:231-245. McCully KS. Enhanced liposomal thioretinaco ozonide compositions and liposomal carrier. US Patent 6,696,082. February 24, 2004. McCully KS. Compositions and method for utilization of thioretinamide in therapy of degenerative diseases of aging. US Patent Application 13/067,504. Filed June 6, 2011. Beard J. Embryological aspects and etiology of cancer. Lancet, 1902;159(4112):1758-1761. Gonzalez N, Isaacs L. The Trophoblast and the Origins of Cancer. New York: New Spring Press, 2009. Beard J. The Enzyme Treatment of Cancer and its Scientific Basis. London: Chatto & Windus, 1911. Republished in New York: New Spring Press, 2010. Moss RW. Free Radical. Albert Szent-Gyorgi and the Battle over Vitamin C. New York, Paragon House, 1988. Meyskens FL Jr, Prasad KN. Vitamins and Cancer. Human Cancer Prevention by Vitamins and Micronutrients. Clifton NJ: Humana Press, 1986. Price WA. Nutrition and Physical Degeneration. 50th Anniversary Edition. New Caanan CT: Keats Publishing, 1989. McCarrison R. Faulty food in relation to gastro-intestinal disorder. Journal of the American Medical Association, 1922;78:1-8. Krebs ET Jr. The nitrilosides in plants and animals. In: The Laetriles—Nitrilosides—in the Prevention and Control of Cancer. Los Angeles: Cancer Book House, 1965. Griffin GE. World without Cancer. The Story of Vitamin B17. Second Edition. Westlake Village CA: American Media, 2009. This remarkable book describes the saga of laetrile from its discovery by Krebs in the 1950s, to testing in animals at the Sloan-Kettering Cancer Institute, and to its banning in interstate commerce by the Food and Drug Administration in 1977. The second half of the book is devoted to the politics of cancer research and the influence of the Rockefeller family, the chemical cartel I.G. Farben, and Federal agencies on medical research, medical education, and protection of radical surgery, radiation therapy, and chemotherapy by the cancer industry. McCully KS. Chemical Pathology of Homocysteine. IV. Excitotoxicity, oxidative stress, endothelial dysfunction and inflammation. Annals of Clinical and Laboratory Science, 2009;39:219-232. This fourth installment of my monograph on the Chemical Pathology of Homocysteine discusses the potent toxicity of homocysteine, glutamate, and other amino acids for nerve cells. The toxicity of fluoride is attributed to effects on oxidative metabolism catalyzed by thioretinaco ozonide and effects of fluoride on hydrogen bonding of enzyme proteins. The discussion explains the role of infections on creation of vulnerable plaques, endothelial dysfunction and inflammation in arteriosclerosis. Wang R. Two’s company, three’s a crowd: can H2S be the third endogenous gasotransmitter? FASEB J 2002;16:1792-1798. McCully KS. Chemical Pathology of Homocysteine. V. Thioretinamide, thioretinaco, and cystathionine synthase function in degenerative diseases. Annals of Clinical and Laboratory Science, 2011;41:301-314. This fifth installment of my monograph on the Chemical Pathology of Homocysteine discusses the synthesis of thioretinamide from retinol by its oxidation to retinoic acid by superoxide synthesized by the heme oxygenase of cystathionine synthase and homocysteine thiolactone. The review discusses the enzymatic therapy of cancer by pancreatic enzymes, glycolysis, nitrilosides, and hydrogen sulfide in malignant cells, and the use of these concepts in the metabolic and nutritional therapy of degenerative diseases of aging. Miles EW, Kraus JP. Cystathionine β-synthase: structure, function, regulation, and location of homocystinuria-causing mutations. Journal of Biological Chemistry, 2004;279:29871-29874. Kim J, Hong SJ, Park JH, Park SY, Kim SW, Cho EY, Do IG, Joh JW, Kim DS. Expression of cystathionine β-synthase is downregulated in hepatocellular carcinoma and associated with poor prognosis. Oncology Reports, 2009;21:1449-1454. Acevedo HF, Tong JY, Hartsock RJ. Human chorionic gonadotropin-beta subunit gene expression in cultured fetal and cancer cells of different types and origins. Cancer, 1995;76:1467-1475. Kelley WD. One Answer to Cancer. Los Angeles CA: Cancer Book House, 1969. Somers S. Knockout Interviews with Doctors who are Curing Cancer. New York: Three Rivers Press, 2009. Mudd SH, Skovby F, Levy HL, Pettigrew KD, Wilcken B, Pyeritz RE, Andria G, Boers GHJ, Bromberg IL, Cerone R, Fowler B, Grobe H, Schmidt H, Schweitzer L. The natural history of homocystinuria due to cystathionine beta synthase deficiency. American Journal of Human Genetics, 1985;37:1-31. This study describes the clinical and epidemiological findings in 629 world wide cases of homocystinuria. About 75% of patients survived to the age of 50, and most deaths were caused by thromboembolism. Selhub J, Jacques PF, Wilson PWF, Rush D, Rosenberg IH. Vitamin status and intake as primary determinants of homocysteinemia in an elderly population. Journal of the American Medical Association, 1993;270:2693-2698. This study of 1160 adult survivors of the Framingham Heart Study original cohort, aged 67 to 96 years, showed that 30% of participants had high levels of blood homocysteine, and two thirds of cases were deficient in one or more B vitamins, including folic acid, vitamin B6 or vitamin B12. McCay CM, Crowell MF. The effect of retarded growth upon the length of life span and upon the ultimate body size. Journal of Nutrition, 1935;10:63-79. McCay CM, Maynard LA, Sperling G, Barnes LL. Retarded growth, life span, ultimate body size and age changes in the albino rat after feeding diets restricted in calories. Journal of Nutrition, 1939;18:1-25. Colman RJ, Anderson RM, Johnson SC, Kastman EK, Kosmatka KJ, Beasley TM, Allison DB, Cruzen C, Simmons HA, Kemnitz JW, Weindruch R. Caloric restriction delays disease onset and mortality in Rhesus monkeys. Science, 2009;325:201-204. Finch CE. Longevity, Senescence and the Genome. Chicago: Unversity of Chicago Press, 1990. Orgel LE. The maintenance of the accuracy of protein synthesis and its relevance to aging. Proceedings of the National Academy of Sciences USA 1963;49:512-517. Harman D. Aging: a theory based on free radical and radiation chemistry. Journal of Gerontology, 1956;11:298-300. Harman D. The aging process. Proceedings of the National Academy of Sciences USA, 1981;78:7124-7128. Ames BN, Shigenaga MK, Hagen TM. Oxidants, antioxidants, and the degenerative diseases of aging. Proceedings of the National Academy of Sciences USA, 1993;90:7915-7922. Ames BN. Micronutrients prevent cancer and delay aging. Toxicology Letters, 1998;102-103:5-18. Stadtman ER. Protein oxidation and aging. Science, 1992;257:1220-1224. Olszewski AJ, McCully KS. Homocysteine metabolism and the oxidative modification of proteins and lipids. Free Radicals in Biology and Medicine, 1993;14:683-693. Dilman VM, Dean W. The Neuroendocrine Theory of Aging and Degenerative Disease. Pensacola FL: Center for Bio-Gerontology, 1992:93-96. Dilman VM. Three models of medicine. An integrated theory of aging and age-associated diseases. Medical Hypotheses, 1984;15:185-208. McCully KS. Homocystine, atherosclerosis and thrombosis: implications for oral contraceptive users. American Journal of Clinical Nutrition, 1975;28:542-549. Stoney CM. Plasma homocysteine levels increase in women during psychological stress. Life Sciences, 1999;64:2359-2365. Stoney CM, Engebretson TO. Plasma homocysteine concentrations are positively associated with hostility and anger. Life Sciences, 2000;66:2267-2275. Hayflick L. Moorhead P. The serial cultivation of human diploid cell strains. Experimental Cell Research, 1961;25:585-621. McCully KS. Macromolecular basis for homocysteine-induced changes in proteoglycan structure in growth and arteriosclerosis. American Journal of Pathology, 1972;66:83-96. Shay JR. Wright WE. Senescence and immortalization: role of telomeres and telomerase. Carcinogenesis, 2005;26:867-874. Shin J-S, Hong A. Solomon MJ, Lee CS. The role of telomeres and telomerase in the pathology of human cancer and aging. Pathology, 2006;38:103-113. Medvedik O, Lamming DW, Kim KD, Sinclair DA. MSN2 and MSN4 link caloric restriction and TOR to sirtuin-mediated lifespan extension in Saccharomyces cerevisiae. PLOS Biology, 2007;5:2330-2341. Sinclair DA. Toward a unifed theory of caloric restriction and longevity regulation. Mechanisms of Ageing and Development, 2005;126:987-1002. Droge W, Shipper HM. Oxidative stress and aberrant signaling in aging and cognitive decline. Aging Cell, 2007;6:361-370. McCully KS. Chemical Pathology of Homocysteine. III. Cellular function and aging. Annals of Clinical and Laboratory Science, 1994;24:134-152. Ingenbleek Y, Barclay D, Dirren H. Nutritional significance of alterations in serum amino acid patterns in goitrous patients. American Journal of Clinical Nutrition, 1986;43:310-319. Ingenbleek Y, Young V. Transthyretin (prealbumin) in health and disease. Nutritional implications. Annu Rev Nutr 1994;14:495-533. Ingenbleek Y, McCully KS. Vegetarianism produces subclinical malnutrition, hyperhomocysteinemia and atherogenesis. Nutrition, 2012;28:148-153. Stolzenberg-Solomon RZ, Miller ER, Maguire MG, Selhub J, Appel LJ. Association of dietary protein intake and coffee consumption with serum homocysteine concentrations in an older population. American Journal of Clinical Nutrition, 1999;69:467-475. McCully KS. Chemical Pathology of Homocysteine. V. Thioretinamide, thioretinaco, and cystathionine synthase function in degenerative diseases. Annals of Clinical and Laboratory Science, 2011;41:301-314. Griffin GE. World without Cancer. The Story of Vitamin B17. 2d Ed. Westlake Village CA: American Media, 2009. Gardner L. Lost Secrets of the Sacred Ark. Amazing Revelations of the Incredible Powers of Gold. London: HarperCollins, 2003. Hudson DR. Non-metallic monoatomic forms of transition elements. British Patent GB 2,219,995A, December 28, 1989. Yablokov AV, Nesterenko VB, Nesterenko AV. Chernobyl. Consequences of the Catastrophe for People and the Environment. New York: New York Academy of Sciences, 2009. Vassily B. Nesterenko was the Director of the Byelorussian Nuclear Center, who died in 2008. He and his son, Alexy V. Nesterenko have the same name as my grandmother Maria Litwinenco’s maiden name: Nesterenko. My grandmother was originally from a family living in Odessa, Ukraine before her emigration with my grandfather to the pioneer farm in South Dakota in 1890. Morgan KZ, Peterson KM. The Angry Genie. One Man’s Walk through the Nuclear Age. Norman OK: University of Oklahoma Press, 1999. Gofman JW. Radiation from Medical Procedures in the Pathogenesis of Cancer and Ischemic Heart Disease. San Francisco CA: Committee for Nuclear Responsibility, Inc., 1999. Muller HJ. The production of mutations. Nobel Lecture, December 12, 1946. Fenech M. The role of folic acid and vitamin B12 in genomic stability of human cells. Mutation Research, 2001;475:57-57. Gonzalez N. What Went Wrong. New York: New Spring Press, 2012. The book explains in excruciating detail how a promising clinical trial of nutritional and enzymatic therapy of human pancreatic cancer was systematically sabotaged by the National Cancer Institute, the National Institutes of Health, the National Center for Complementary and Alternative Medicine, and Columbia University. McCully KS. Compositions and method for utilization of thioretinamide in therapy of degenerative diseases of aging. US Patent Application S.N. 13/067,504. Filed June, 2011.